Ever since I first posted about him almost a year ago Logan Lerman has quickly become a regular on the Most Stylish of the Week posts. Last week, at a Q&A for his latest film 'Percy Jackson: Sea Of Monsters', Logan went for a subtle look, which was actually a great combination of textures. A grey chambray button-down shirt is always a great choice when going for a feel between smart and casual. He paired the shirt with a khaki knit tie, which made the whole look feel quite muted and grown up – it's thanks to Logan's signature undone tie that it also feels relaxed and young. 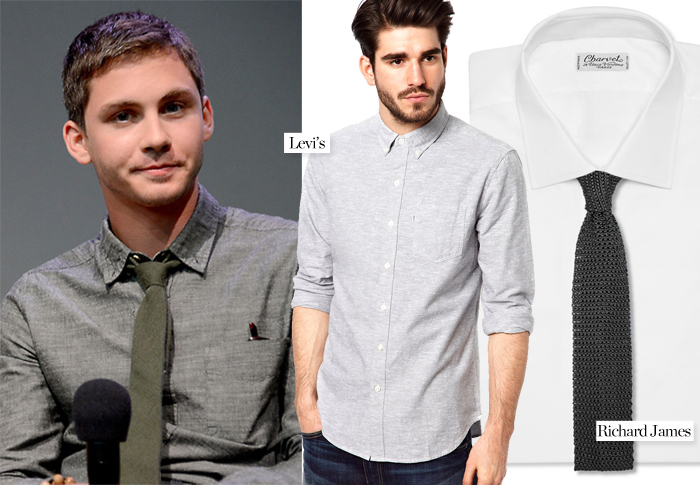 Since I am not a huge fan of dark-on-dark colour combinations in my outfits, I would do Logan's texture play with a lighter shade of grey chambray shirt like this one from Levi's and perhaps a charcoal knit tie such as this one from Richard James.